Our MATTRESS surface has all the features of a number bed, a do-not-disturb mattress and a NO-flip mattress. NSC Medicals Hybrid Soy Visco Medi-Gel is our own infusion blend where the gel is INFUSED into the Soy based Visco. This unique technology provides true gel attributes; a cooling surface for the skin with the comfort and durability of pressure redistributing Soy Visco GEL TECHNOLOGY along with ASSISTING IN SPINAL decompression while sleeping. 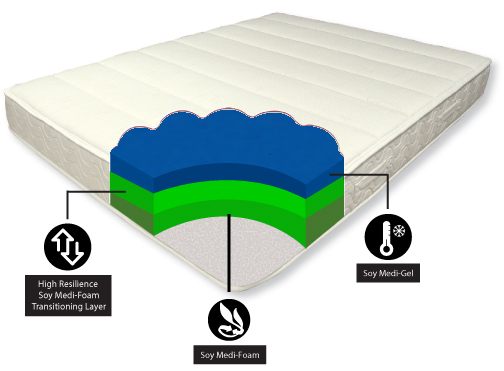 This MATTRESS surface is constructed with a top layer of open cell, Soy Visco Medi-Gel, assist with keeping the b ody cool while wicking away moisture providing a cool and hypo-allergenic sleeping environment. 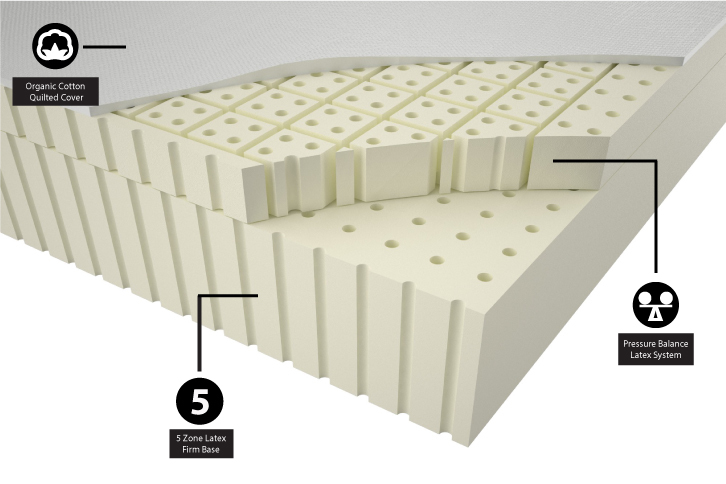 The bottom layer is a Soy Medi-Foam that assists in weight bearing and longevity of the mattress surface while providing consistent pressure redistribution in all sleeping positions. NSC Medical is conscientious of our carbon footprint therefore providing Soy Foam, Soy Visco and Soy Gel Hybrid Foams as an alternative to 100% petrochemical based products. Cloud top channel quilted bamboo removable and washable cover. 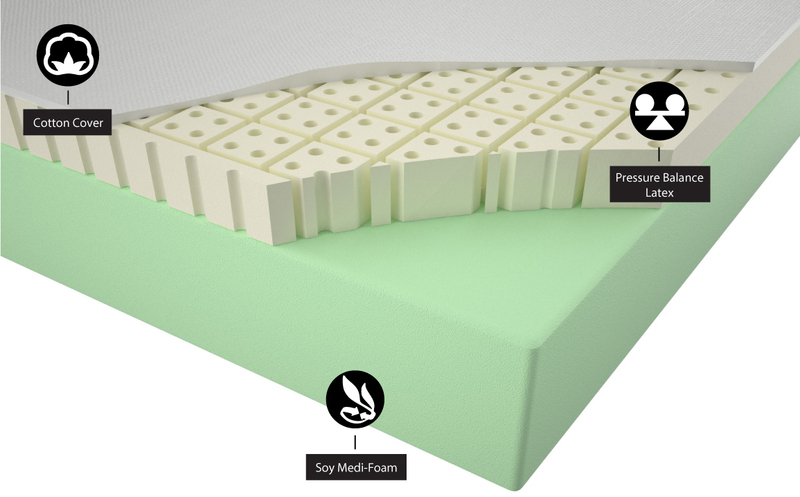 MEDI-FOAM a soy based high density low compression base foam. All NSC Medical Products are Certi-Pur Certified. Developed and Manufactured in Canada with component traceability. NSC Medicals Hybrid Soy Visco Medi-Gel is our own infusion blend where the gel is INFUSED into the Soy based Visco. This unique technology provides true gel attributes; a cooling surface for the skin with the comfort and durability of pressure redistributing Soy Visco GEL TECHNOLOGY along with ASSITING IN SPINAL decompression while sleeping. This neutralizes the off gassing smell that irritates consumers and reducing heat retention which is the largest complaint from 100% petrochemical based products. 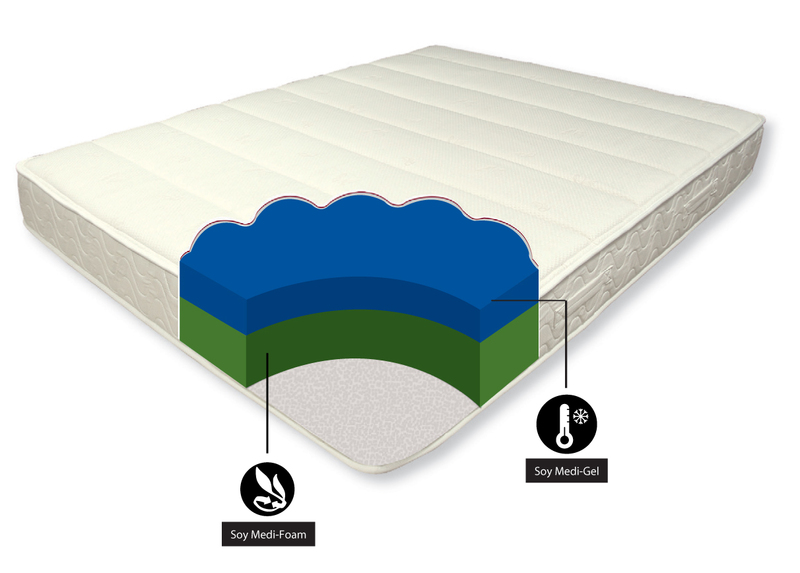 This MATTRESS surface is constructed with a top layer of open cell, Soy Visco Medi-Gel, assist with keeping the body cool wh ile wicking away moisture providing a cool and hypo-allergenic sleeping environment. Soy Medi-Foam transitional middle layer for added comfort. Natural Sleep Concepts Latex is the first patented pressure balance latex system in the industry. It neutralizes the off gassing smell that irritates the patient as well as reducing heat retention which is the largest complaint from 100% petrochemical based products. 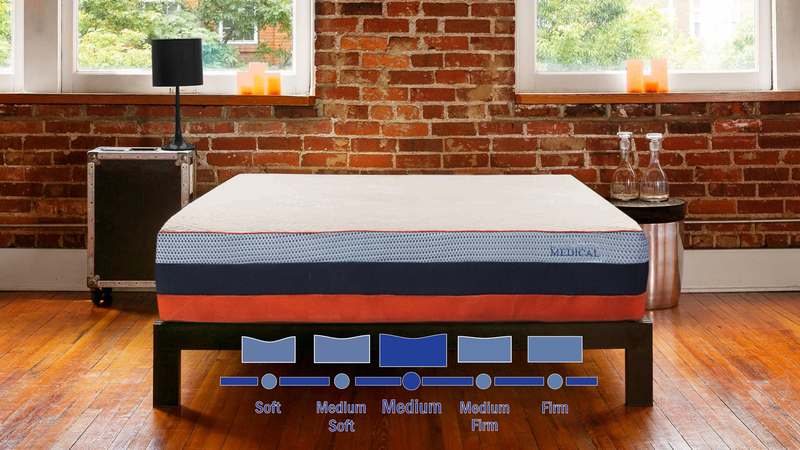 The patented pressure balance system uses individual beams that are inter-connected assisting with pressure point relief while still providing a cloud like comfort. The first Hybrid Latex System in the Industry! French Channel Quilted Organic Cotton Cover Oeko-Tex 100 Certification for confidence in textiles manufacturing of cover. TUV Certified and tested for Validation of quality on German standards. Natural Elements™…By NSC Medical is the first 100% all-natural latex therapeutic mattress. NSC Medical has created an unparalleled therapeutic latex mattress, the first of its kind in the industry! The top layer of our patented pressure balance latex system uses individual beams that are interconnected and articulate assisting with pressure point relief. While the bottom layer consists of a 5 zoned natural firm latex providing even weight distribution. Covered with an organic cotton cover with temperature regulating wool providing all the key elements for a good night’s rest. 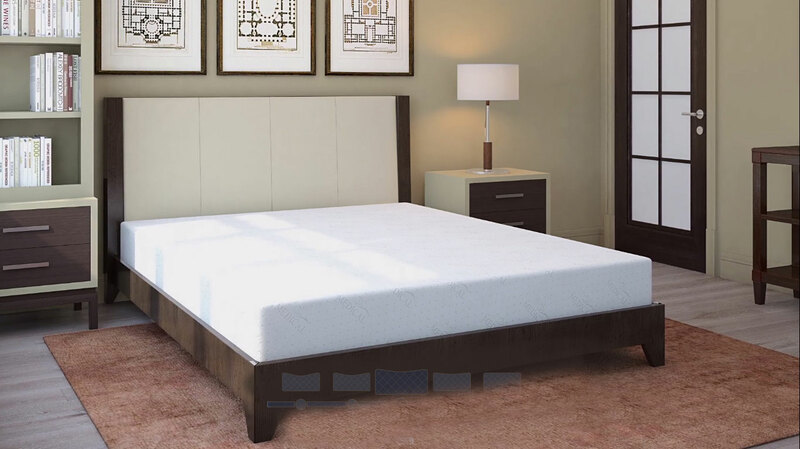 This 11” therapeutic mattress assists with body support, cloud like comfort, spinal realignment and natural content with NO synthetics providing a true hypo-allergenic and natural sleep environment. NSC Medical offers the first therapeutic mattress with patented technology and the first all-natural latex mattress in the industry. Offering 4 global certifications for organic content and material with protein extracted latex making our latex hypo-allergenic and 100% all natural. loud like comfort, while our 5 zoned latex base provides weight bearing attributes for weight bearing support and longevity. 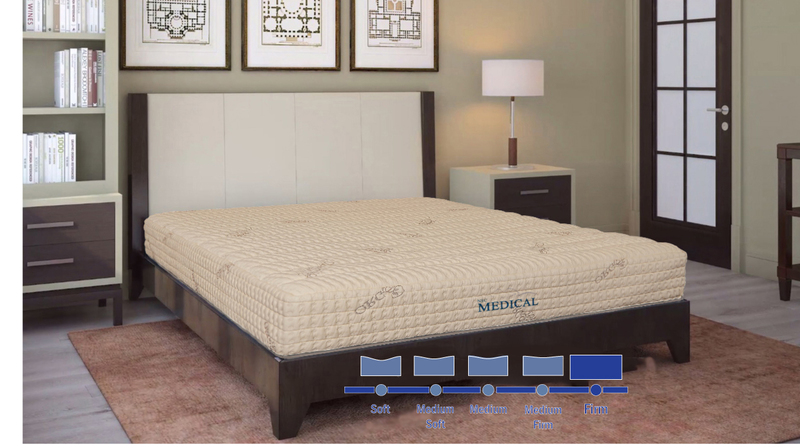 Organic Cotton quilted cover with wool temperature regulating layer imbedded into the cover and closed stitched piping around the bottom parameter of the therapeutic mattress. Manufacturing traceability on all components. 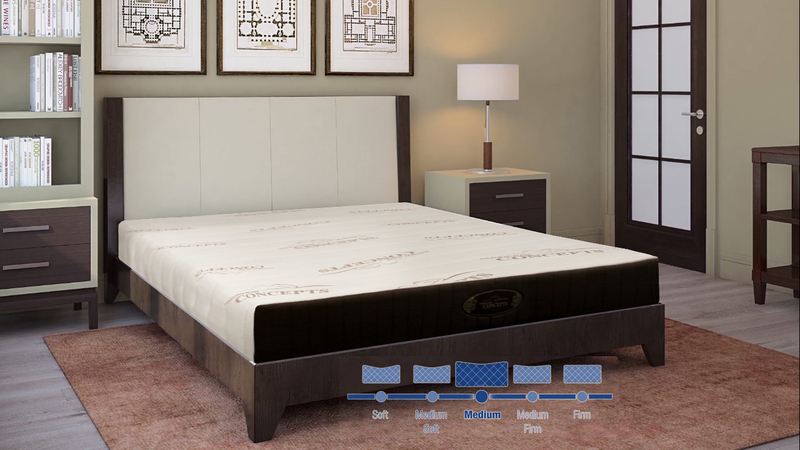 Wake up rejuvenated with copper infused Talalay latex sleep surface with cooling medi-gel pressure relief comfort level that assists with spinal decompression and proper alignment while sleeping. Copper is known to be a cooling agent with healing properties. NSC Medical has engineered a revolution to the sleep surface industry! Since 1/3 of your life is SPENT on your bed! Work hard, play harder, relax and Rejuvenate with NSC Medical. 3D breathable mesh cover wicks away moisture. Talalay latex provides a cloud like comfort with infused copper that keeps the surface cool and assists with healing properties. Protein extracted Talalay latex is hypo-allergenic and a non-breeding ground for mold, mildew and bacteria. Medi-Gel assists with spinal decompression, pressure point relief and motion transfer. Medi-Foam assists with weight bearing support. Copper is known to reduce joint inflammation, pain and stiffness. Copper is known to emit a number of antioxidants and anti-inflammatory properties. 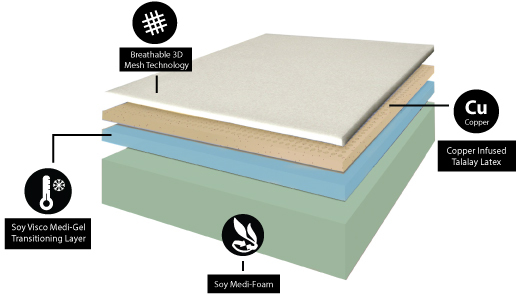 NSC Medical is the first company to create a mattress with 100% all natural Talalay latex infused with copper. 10 Year Non Pro-Rated Warranty. We are a Medical Device company and this product is Developed and Manufactured in Canada. NSC Medical’s Correct Body Form Therapeutic Mattress is made with our own proprietary soy visco gel technology which is clinically proven to keep the sleep surface 1-2 degrees lower then body temperature while assisting with spinal decompression while sleeping. 0% motion transfer so your partner will not be disturbed throughout the night. Qualux 2.6lbs Flexi-Foam Base with 700lbs weight capacity can accommodate any box spring or adjustable bed in the industry. Commak Cover awarded the most intelligent fabric in Europe and the first breathable and fluid proof cover in the industry which is machine washable exclusive to NSC Medical. This neutralizes the off gassing smell that irritates Patients/Residents, as well as reducing heat retention which is the largest complaint from 100% petrochemical based products. NSC Medical is conscientious of our carbon footprint, therefore providing Soy Foam, Soy Visco and Soy Gel Hybrid Foams as an alternative to 100% petrochemical based products. This technology reduces our carbon footprint by up to 30%.